With Toontrack's EZ Keys software, you don't have to be a piano player to put together a professional-sounding piano part! Songwriters will love how simple it is to create a song from parts, or turn a complete song into a beautifully played piano piece. Want to transpose the key for a song or section? It's easy! Experiment with different chords and progressions? Simple! No matter what genre your project falls into, EZ Keys has you covered — with professionally played samples that fit all kinds of different musical styles. Perfect for songwriters, arrangers, and performers alike, EZ Keys works inside your DAW or in standalone mode. If you have registered at least one EZkeys Instrument already, you are eligible for the reduced "EZkeys Sound Expansion" to get the Grand Piano and save big! The centerpiece of EZ Keys is an exquisitely sampled, perfectly tuned Steinway and Sons Model D grand piano. 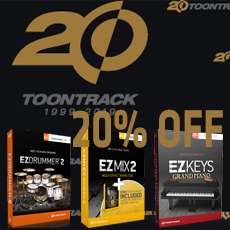 Toontrack meticulously recorded every note, nuance, and element of this industry-standard piano and turned it into an expressive, beautiful instrument inside EZ Keys. If you're a keyboard player, you'll love this sound library as both a creative tool and as a standalone virtual instrument. But, even if you're not, you can easily put this amazing piano into your tracks — thanks to great tools EZ Keys gives you to work with. To give you tons of flexibility, Toontrack has included 14 mix-ready presets in EZ Keys. From pure to gritty, from dirty to dreamy, there is a piano sound for any project you're working on. Want to tweak the tone further? Each preset has four variable settings to change everything from space, drive, echo, tone, loudness, body, detune, and more! The heart and soul of EZ Keys is its songwriting function. Whether you're starting from scratch, bringing in an existing MIDI file, or using the Song Browser to piece together some of the included ready-made parts, you'll find that EZ Keys is both intuitive and feature-rich. Even if you've never played a keyboard before, it's easy to start playing and making files in EZ Keys! Pick the style you want to work within and immediately start working with intros, verses, choruses, and other song components — all real piano parts, played by real session pianists! Thanks to Toontrack's innovatively designed Chord Wheel and key transposition tools, you can quickly pick your song's key, add chords (majors, minors, and all the "flavors" within them), then experiment with different chords progressions, song part arrangements, change the dynamics, add color to chords... nearly anything at all! Need to bring in a project you've already started? Or maybe you'd like to start with another song and make it your own? Simply drag and drop a MIDI file onto the Arranger timeline and EZ Keys will not only import it, but analyze the chord progression, and even change the key to fit your current project, if you choose! Once you've created the song or chord progression you want, exporting a MIDI file from EZ Keys is a snap. Just select the chords in your song track, drag them over to your computer's desktop, and your MIDI file is automatically created for you! Now, you're ready to use that progression inside your DAW or with your favorite virtual instrument! It doesn't get any easier than this! Using EZ Keys as a plug-in inside your DAW of choice, you can record audio directly to an audio track. Or, when your chord progression or song is complete, simply drag and drop the MIDI from the Arranger timeline onto a MIDI track for routing through any other virtual instrument you choose! This is a good solid piano sound coupled with great functionality to compose quickly. Wonderful piano VST with lots of options. Makes composing and improvising really fun and easy.